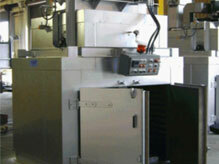 The oven pictured is typical of a small, BATCH TYPE OVEN. Depending on your application, and available utilities, these ovens can be heated electrically, or with gas, steam, or hot water. This customer opted to add a powered exhaust, beacon, and a stainless steel interior. The approximate dimensions of the unit above are: 8 feet long X 8 feet wide X 10 feet tall.